In my office, when I’m searching for a pen, I often can only find colored pencils. During my workshop The Art of Mindful Tutoring: Creative Tactics to Encourage Emboldened Writing at SCWCA 2018, I offered art supplies to administrators, tutors, and professionals to brainstorm unique tutoring strategies using Sherwood’s “four elements of artistry” and improvisation (Boquet and Eodice). After we explained synthesis with quilts, cartoons, color codes and paper footballs, I flew home inspired by my peers’ creativity and willingness to creatively reframe their practices. As an artist and what Steve Sherwood calls an “artist-as-tutor,” I am both “hunter” and “maker” of kairotic situations. By following creative impulses, I encounter singular opportunities to nudge writers down paths of creative inquiry and emboldened writing, which I define as writing instilled with boldness, authentic heart and purpose. We craft this kind of writing from what author and analyst Clarissa Pinkola Estés calls ”necessary creative rests, riffs, and raptures.” I trust my artistic instincts because when I explain synthesis with purple Sharpie scribbles on a stray napkin, students always ask to keep the drawing. Sitting with me, they riff off my spontaneous sketch and conjure meaning from my scrawled circles and squiggly lines. I am reminded of a line from The Blithedale Romance: “The profoundest wisdom must be mingled with nine-tenths of nonsense; else it is not worth the breath that utter it". I find students will “utter nonsense” and ask ‘what if?’ when they’re comfortable being in my presence, which only occurs when I frame the session as a blank canvas on which our linguistic hues never dry. In discussing the need to “dis-cover” ideal educational community, Duffy reflects on “being over doing” as a key learning practice. As mindfulness practitioners say, “being” requires accepting ourselves as we come (to writing). As an artist and amateur yoga practitioner, I come at “being over doing” full force and desire to help students “be” writers through playful, creative reframing. When we embrace failure as an ingredient of effective composition, emboldened writing occurs. In my office, “failure is framed as iteration,” to adopt a game-like learning principle from The Institute of Play. In addition to art studio, my office doubles as a playground where tumbling blocks and scraped knees equal kairos. When I challenge students to randomly use a new word three times in our hour together or when I ask them to “literally show me don’t tell me” about their claim, we create a “shared acknowledgement of flawedness that creates mutuality, the condition that allows people to come together without fear or facades.” We improvise rhythms of trial and error, out of which sudden bursts of discovery inevitably arise. Our session mimics an art salon or atelier, in which composing is synonymous with ‘being’ and “becomes a kind of bridge that draws humans together,” where idiosyncratic quirks and interests are celebrated. 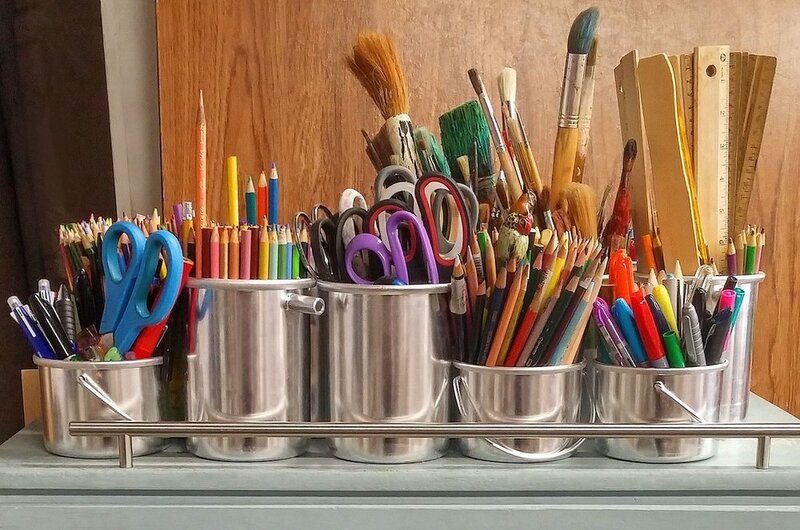 “Being” + creative inquiry + artist-as-tutor’s studio= radical invention. When we enact this equation, the student and I drop facades, forget prescriptive rules, and discover dormant ideas. When the artist mixes the right shade of green and when the dancer discovers the perfect combination, they are “being” creatively vulnerable, not afraid to sift through the ineffective “nonsense” to “dis-cover” its potency. Creative inquiry doesn’t necessitate reinventing the pen. I believe we all carry innate creative tendencies that the right setting can excite. “I don’t have a thesis,” the writer says. “Close your laptop. Imagine we’re strangers in line at Disneyland. Two minutes before our turn, I ask about your essay, as a stranger does. Now what?” Suddenly, they’re licking ice cream in line for the loopiest roller coaster in the West. Maybe they smell popcorn and sunscreen. I watch as imagination steers. Enter proprioception and emotion, two basic components of creativity inquiry necessary in the move towards mindful writing center practices (Mack and Hupp). I adhere to this illuminated trajectory when, instead of asking what students are thinking (doing), I ask, “What thoughts are happening right now? What do you feel they want?” I often receive a rich, nuanced reflection when the student is asked to be, feel, and respond—to be their inner artist. By creatively reframing, or playing pretend, the writer embodies the brainstorming process, voiding logic’s editorial scrutiny. In this way, creative reframing allows us to counteract writer’s block in the flesh. “Nothing I write works,” the writer laments. “Let’s switch chairs. I’ll be you. You’re the evil editor. What are you saying to you?” A long pause. In addition to deconstructing inner-editors, we can creative reframing text itself. Another writer hit a roadblock in an advocacy proposal’s attempt to convince her Indian grandfather’s generation that religious cattle slaughter is an obsolete custom. We quickly sketched her grandfather, propped him up, and commenced verbal argumentation with a piece of paper. We also drew and consulted the cow. Amidst laughter and long moo’s of frustration, the student felt comfortable enough to boldly ask, “what if”, the magical element of authentic composition, from writing a musical score to structuring an argument or crafting a poem. “My professor said my poem’s stanzas don’t work,” the student charges. On a whim, I offered scissors. She relaxed, sat back in the chair, and cut apart the poem with delicate precision. As I watched her carefully rearrange the stanzas, she caressed the paper slips as if they were alive. I believe, through free physical interaction with the text, she discovered empathy for the poem’s growing pains. Any actor, performer, or dancer would agree. “There are times when the simple dignity of movement can fulfill the function of a volume of words,” exclaimed twentieth century modern dancer and choreographer Doris Humphrey. The students settled on a new structure, carefully stacked the stanzas and left smiling. Through creatively reframing the editing process to a series of spontaneous gestures, the writer discovered the poem’s destined anatomy. We can also creatively reframe our physical and mental spaces. I know when a particular student’s anxiety strikes. Her spine snaps to attention and she turns militant. Being an anxious creature myself, I know this psychosomatic invasion that whitens the knuckles. “I’m a mess. I can’t….” She freezes, doe eyes dart around the room, its walls closing in. This is panic embodied and I see the kairotic potential. “Let’s go outside.” So we took off our shoes, walked through the grassy campus park, and she purged her mental chaos in no particular order. Together, we found a shared rhythmic gait. Gradually I could feel the stress ricocheting inside her skull start to fizzle in the breeze. Eventually, she mentioned something relevant to her essay. “That reminds me: what if we tried….” I offer. We eventually wandered back into our center with a seed of thesis. “Art is either a plagiarist or a revolutionary,” exclaimed French Post-Impressionist artist Paul Gauguin. As is writing. Considering the stakes students face in today’s academic and socio-political climates, I not only want students to boldly write, but to feel emboldened, particularly language learners barely scraping by in new academic—and cultural— discourses. And yes, when I offer direction on comma placement, I encourage novices to begin shaping, however tentatively, their avant-garde potential. Michelangelo believed sculpture lives unrealized inside a rock. The sculptor must simply discover and free its form. I apply this to my tutoring practice. Instead of granite, I treat each session like a chunk of fresh clay. If a form doesn’t work, we squish it up and start over. Through playful trial and error, we encourage discovery. If we fail to persuade our grandfather his tradition is archaic it’s okay. Today, he’s made of paper. When we’re told our poem doesn’t “work”, we try new tools to dissect and reassemble its tissue to more readily invoke authentic textual extensions of self. A writer recently divulged, “I feel my writing is....disconnected.” This adjective is dangerously poignant for us all. “If I were to describe the present human moment,” says poet and Naropa Institute graduate Eleni Sikelianos, “I might offer the words ‘connection and disconnection,’” which necessitates “attend(ing) to consciousness more than ever to make sure our minds are still our own to be made up.” What do our students do with this warning? We hope they turn to those who understand that living in and from the head is no match for living—and writing— from the gut and its own heart. I hope that means us. Through creative reframing and a mindset of playfulness, a writing center can be a campus destination of creative inquiry that prepares students to navigate life’s rhetorical situations. As a student once expressed, “my mother and teachers told me not to paint grass blue and sky green. So I chose to major in art.” I say paint in whatever color speaks to you. And color will speak if you listen. With a nudge of creative reframing, a writing center can incubate creatively-inspired composition and revolution itself. As artists-as-tutors, let’s appropriate the psychic matter that makes us fallible humans--thought, memory, feeling, impulse—as the proverbial Play-do we need to work, live, and write with radical innovation, as the artists I believe we all innately are. Boquet, Elizabeth H. and Michele Eodice. “Creativity in the Writing Center: A Terrifying Conundrum.” Creative Approaches to Writing Center Work. Eds. Kevin Dvorak and Shanti Bruce. Hampton Press, 2008. Duffy, Keith. “Doing or Being? Discovering Classroom Communities: Part 2.” AEPL’s Blog, 26 Sept. 2017. Accessed 16 Apr. 2018. “Game-like Learning Principles.” Institute of Play. Accessed 20 Apr. 2018. Mack, Elizabeth, and Katie Hupp. “Mindfulness in the Writing Center: A Total Encounter.” Praxis: A Writing Center Journal, vol. 14, no. 2. Accessed 7 Apr. 2018. Sherwood, Steve. “Portrait of the Tutor as an Artist: Lessons No Can Teach.” Writing Center Journal, vol. 27, no. 1, 2007, pp. 52-66. Sikelianos, Eleni. “Refuse/Refuge: Be Longing.” Poetry Foundation, 12 Feb. 2018. Accessed 15 Apr. 2018. Lindsey Allgood is a Writing Specialist at the University of California, Irvine, Writing Center. Previously, she served as a graduate assistant at the University of Oklahoma Writing Center, where she received her MFA in fine art.